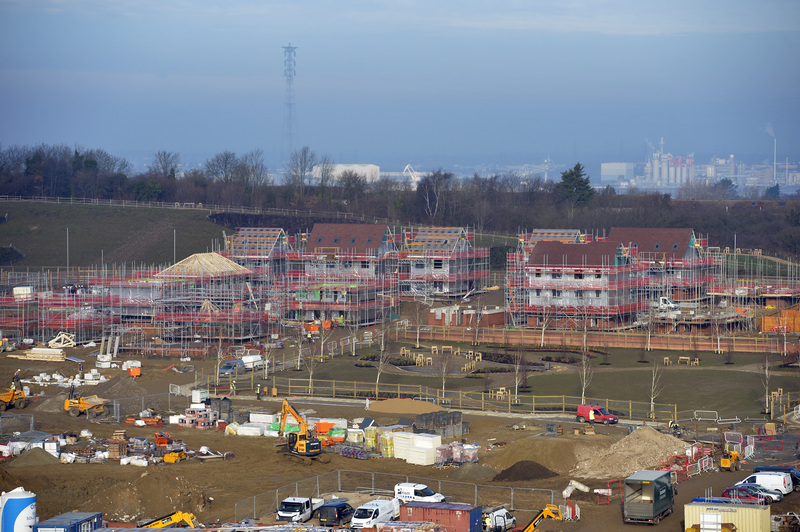 More than 600 homes have been started in Ebbsfleet Garden City in the last year, new figures show today. Ebbsfleet Development Corporation (EDC), which was set up to help speed up the pace of delivery of homes in the Garden City, saw 614 homes being started over the last 12 months. And local buyers have been snapping up properties with the Government’s Help to Buy scheme being used in up to 90 per cent of purchases. Persimmon is building 170 homes and Clarion Housing 125 affordable units. Persimmon has sold 40 units and has 10 occupants as at 15 March 2017. Clarion has released 25 units and all have been reserved as at 28 March 2017. First occupations are due in May. Barratt Homes is building 112 units. 42 have been released and all sold as at 28 March. Redrow’s first phase of 180 homes is progressing well with around 70 properties sold and more than a dozen occupied. The Garden City’s first pub at the entrance to Ebbsfleet Green is being built by Marston’s and is already taking shape and is expected to open in October. Countryside Properties is currently building its latest phase of 123 homes providing a mix of apartments and houses in the heart of Ebbsfleet Garden City. Due to the excellent sales rate Countryside is looking to release its next phase of development, a further 35 homes in the coming weeks, and to open two new show homes in May 2017. In addition to homes, the Garden City’s first primary school, Cherry Orchard, will open in September, just 18 months after being given planning permission, and work will start in the summer on a new £12million bridge linking Springhead Park with Ebbsfleet International Station which the EDC secured funding for as well as a series of new walkways and cycleways across the Garden City. Paul Spooner, Interim Chief Executive of Ebbsfleet Development Corporation, said: “This has been a truly remarkable year for the Garden City as we have exceeded the 600 target for the number of starts on new homes – compare this to the previous year when there was just 60 starts on site and you see a picture of rapid development taking shape. “Our private partner housing developers tells us that interest in the Garden City is incredibly strong and sales have been buoyed by the Help to Buy scheme which is giving younger people a real step up on the property ladder. “Much of the success of Ebbsfleet Garden City is down to its location and the rail link that can get you into central London in just 17 minutes and developers report that people from around Kent who work in London now see this as a prime destination to live, especially with the wide range of housing on offer. Iain McPherson Managing Director of Countryside’s New Homes and Communities South region said: “Since the launch we have experienced a high volume of sales as a result of affordable homes in a desirable location for many local buyers, as well as those wanting a commutable location due to our close proximity with Ebbsfleet International Station. Rachael Baillie, sales director for Redrow Homes (South East), said: “The response from purchasers has been nothing short of phenomenal.